The MacBook Air's port hatch is beautiful, but its diminutive size makes for some USB connection issues. Enter AirQueue, a 20cm (7.75in) USB 2.0 extension cable custom designed to enable USB devices with large or unusually designed connectors to work with the MacBook Air. Furthermore, AirQueue is the only USB 2.0 extender cable certified to work with Synchrotech's MicroU2E USB ExpressCard reader. The AirQueue and MicroU2E combination allows deployment of a whole range of USB 2.0 based ExpressCards with MacBook Air, including wireless broadband devices like the Kyocera KPC680 and Sierra Wireless AC597E! 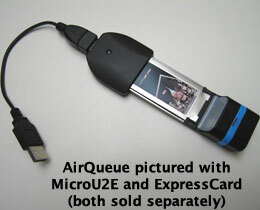 AirQueue provides mobile users the perfect distance away from a USB port. No need for 1 to 2 meter extension cables at a coffee shop or airport. AirQueue features the highest quality shielding, connectors, plating and molding. Incredibly durable, its superior manufacturing allows for 480Mbps operations. AirQueue works for any A (Male) to A (Female) need, and is an inexpensive, elegant way for ending port blocking problems. Use MicroU2E or USB devices with large or unusually designed connectors with MacBook Air!